Bluegrass in the Ko`olau kicks off FRIDAY, April 26, at Ho`omaluhia Botanical Garden in Kaneohe! Join us for one, two, three or four days (Friday, Saturday, Sunday, and Monday April 26 - 29), as an acoustic musician, or as somebody who just loves to listen to great homegrown bluegrass and traditional music! ALL ARE WELCOME to this FAMILY FRIENDLY EVENT! Although this is a free event, we request a donation of $40 for the weekend, which considering it includes camping fees and meals for the weekend is cheap! MAHALO! Anyone not a member can join Bluegrass Hawaii at www.bluegrasshawaii.com/joinus.html. We have been fortunate to have the continued welcome of this beautiful botanical garden. PLEASE KOKUA AND FOLLOW THE RULES OF THE PARK! DO NOT PARK ON THE GRASS!! Vehicles must stay on paved roads or parking lots at all times! ALCOHOL, fireworks, firearms, generators, amplifiers, and electric plug usage are not permitted. Please, NO FIRE BATONS! No fires are allowed outside of the designated area. Campfires are permitted on concrete fire pads. Please bring your own grill tops and firewood or charcoal. Nails and other metal from firewood must be placed in dumpsters; DO NOT leave on firepads or lawns. Sorry, NO PETS. No ball playing or similar games. Collecting of any plants, fruits, flowers, seeds and/or other plant parts is not permitted. Do not tie, nail or attach anything to trees or structures. Swimming and wading in the lake and streams is NOT permitted. Collecting twigs and branches for kindling is not allowed. Please dispose of charcoal in green disposal rings. Fires must be 20 feet from building. Please respect, comply, and follow the rules and directions from the Park and Bluegrass Hawaii Staff. The staff is available to ensure everyone's enjoyable weekend and the continued welcome of Bluegrass Hawaii at this wonderful venue! 9:00 am Park opens; find your campsite, set up your tent and START JAMMING! "Harmony:Know the rules so you can break 'em!" Bob Schornstheimer has been doing this workshop on basics of jamming for years! Come with your axe and without your inhibitions. Lesley Kline will lead another session of her fiddle calisthenics. Sign up starting Friday noon at the registration table for this event! For fiddlers and others interested in playing fiddle tunes. Bring a tune or two to share. 1:00 - 2:00 Open No-Mike with genial host/enforcer Andy Char. Ten-minutes slots (subject to review based on number of sign ups). Sign up starting Saturday at 3:00 at the registration table. 9:00 PM - 9:15 PM: Guests may EXIT ONLY. ALL guests (campers and non-campers) who wish to stay past 4:00 PM on any day of our event must check in at the Visitors' Center to obtain parking passes for their vehicles. Please do this before proceeding to our site! The Visitors' Center is open between 9:00 AM and 4:00 PM all four days of our event. 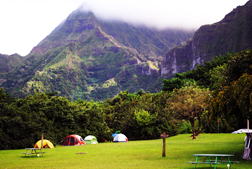 You will need to provide your license plate number, make of your car, number of people in your party, and the name of your campground (Kahua Nui), and please let 'em know you're with the Bluegrass Hawai`i group. If you cannot arrive at the Garden by 4PM on Friday, Saturday or Sunday, there's another very short window of opportunity on each day during which you can enter the gates. But you'll need to call ahead to arrange for a parking pass! On the day you plan to come, call the Visitors' Center at 233-7323 and ask them to leave your parking pass with the security guard. (Remember, you'll need to provide your license plate number, make of your car, number of people in your party, and the name of your campground--Kahua Nui--and let 'em know you're with Bluegrass Hawai`i!) If you arrive between 5:30 and 6:30 PM, the guard will let you in. That's right: between 5:30 and 6:30 PM! Where To Camp: Please pitch your tent to the LEFT of the pavilion and up the gentle slope, as you're facing the mountains. If you pitch your tent close to the pavilion or restrooms, you will be asked to move it. IMPORTANT - folding chairs to sit around the campfire!! !